Air India Engineering Services Limited (AIESL) Issued a Advertisement For Recruiting fifty nine AMEs, Aircraft Technician.All Eligible and Willing applicants Can Check Detailed Advertisement From Their Official Website And Attend Walkin Interview On Or Before 30th August And 14th September 2017.Eligible and Interested Candidates Can Check Detailed Information For Each Postion Such As - Eligibility Criteria, Qualifications, Age Limit, Selection Procedure Before Applying. Salary And Grade Pay Scale- INR Rs.20000/- (For Post Aircraft Technician) . 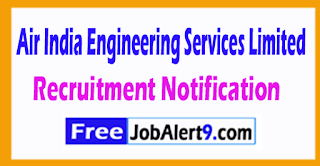 Address -Air India Engineering Services Limited, Maintenance Training Organization, Near Mascot Hotel, Thiruvananthapuram-695033 . Important Dates - Last Date for Walkin Interview Is: 30-08-2017 And 14-09-2017 . AIESL Recruitment 2017 Detailed Advertisement. 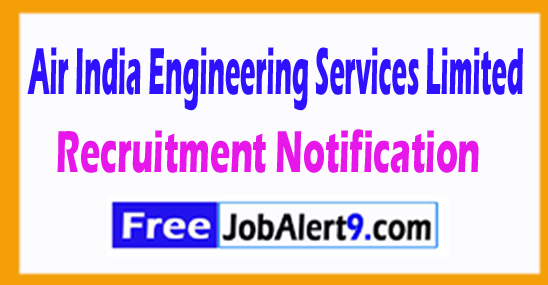 Air India Engineering Services Limited (AIESL) Issued a Advertisement For Recruiting 85 Assistant Supervisor.All Eligible And Willing Candidates Can Check Detailed Advertisement From Their Official Website And Apply Offline / Before 20-08-2017.Eligible &Interested Candidates Can Check Detailed Information For Each Postion Such As - Eligibility Criteria, Qualifications, Age Limit, Selection Procedure Before Applying. Salary And Grade Pay Scale- INR Rs. 15,180/-. Candidates Must Pass Diploma, Graduation Degree or its Equivalent Qualification from a recognized Board / University. Candidates Can Download Application Form through official website (http://www.airindia.in). After Filling The Application form, Candidate must send hard by copies of Application along with relevant testimonials Mentioned In Detailed Advertisement to the following Address Before /(20-08-2017). General Manager (Engg. ), Air India Engineering Services Ltd. (NR) A320 Avionics Complex, IGI Airport, New Delhi-110037 . Important Dates - Last Date for Receiving of Offline Application Form Is: 20-08-2017 . Click Here For AIESL Recruitment 2017 Detailed Advertisement.